Sweet potato is an important 'indigenised' root crop in South Africa. It features prominently in smallholder cropping systems because of its versatility, drought tolerance and positive role in food security. It outranks most staple crops in vitamins, minerals, dietary fibre and protein content. Much information is available on sweet potato as a drought tolerant and food security crop, but critical reviews that link its drought tolerance with food security are lacking. We review sweet potato as a food security crop, focusing on mechanisms associated with drought. We conclude that the crop has great potential in the light of imminent challenges associated with drought as a negative effect of climate change. Globally, sweet potato (Ipomoea batatas L.) is considered an important, versatile and underutilised food security crop.1,2 It belongs to the second most important set of food crops in developing countries, namely root crops.1 The crop is highly nutritive, and it outranks most carbohydrate foods in terms of vitamin, mineral, dietary fibre and protein content.2,3 A recent report from the Food and Agriculture Organization (FAO)4 indicated that 24.8% of the population in southern Africa remain undernourished and agricultural projects and crops that can deliver quick results were needed to meet the first 2015 millennium development goal. Sweet potato is one crop that has a wide ecological adaptation, drought tolerance and a short maturity period of 3 to 5 months.3 It can also be harvested sequentially, thus ensuring continuous food availability and access, an important dimension of food security. Prior to 1986, sweet potato was regarded as a low value, low status and highly perishable commodity in southern Africa.5 It received little research attention until the Southern African Root Crops Research Networks (SARRNET) intervened by distributing germplasm and encouraging demand-led research. This initiative prompted the release of several new varieties within southern Africa. Orange-fleshed and yellow-fleshed cultivars have been recognised as good sources of ^-carotene, a precursor of vitamin A6,7 and are promoted across the developing world. According to Laurie8, vitamin A deficiency in South Africa is still a serious health problem. Studies by Labadarios9 reported that 64% of children between the ages of 1 and 9 years, and 27% of women of reproductive age, were vitamin A deficient in South Africa. The highest prevalence was concentrated in Limpopo (43.5%) and KwaZulu-Natal (38.9%). Poor education of mothers was highlighted as the main cause of vitamin A deficiency in rural communities.6 This deficiency suggests that nutrition education, not just literacy, needs to be part of participatory studies on food security in the rural areas affected by poverty and malnutrition. Sweet potato is a drought tolerant crop with the potential to enhance food and nutrition security, especially for subsistence and small-scale farmers in South Africa. For sweet potato, drought stress accounts for 25% total annual yield loss14 compared to more than 50% yield loss or complete failure in staple crops such as maize.15 Despite this advantage, its importance as a food security crop is still underestimated and fails to attract sufficient attention from agricultural researchers. The aim of this review was to illustrate, from an agronomic perspective, the importance of sweet potato as a traditional drought tolerant and potential food security crop. According to Laurie8, sweet potato was introduced to South Africa in 1652 around the time when the Dutch, under the leadership of Jan van Riebeeck colonised the Cape. It is now referred to as one of the traditional crops19 and a plant of the past1 because of the time it arrived in Southern Africa. Sweet potato has been indigenised13,19 and classified as a neglected and underutilised crop species. About 12 cultivars were released by the Agricultural Research Council between 1959 and 1989: 7 new (cream-fleshed) varieties and 1 locally bred orange-fleshed variety (Serolane) were released (in South Africa) for local production during the 2003/2004 season.11,20 According to Laurie8, nine of the released varieties to date are orange-fleshed sweet potato (OFSP) varieties. Production of these varieties has also spread throughout the tropical and warm regions of the country, the main producing regions being the Western Cape, northeast Limpopo, Free State, Eastern Cape, Gauteng, Mpumalanga lowveld, and northern KwaZulu-Natal Provinces. KwaZulu-Natal is a subtropical region situated on the east coast of South Africa with diverse climate, soils and topography, virtually making it a 'world-in-one'.21 It is a summer rainfall area (600-2000 mm/annum) with weather that ranges from extremely hot along the coast in summer to heavy snow in the mountainous midlands in winter.21,22 KwaZulu-Natal has three climate zones of which 1% is tropical, 44% subtropical and 55% temperate.22 The environment in the tropical and subtropical parts of the province are regarded as suitable for sweet potato production throughout the year. Depending on whether farmers produce the white or OFSP varieties, the high prevalence of vitamin A deficiency7,9 in the province could be controlled through the consumption of this vegetable (Figure 1). Variations in the climatic zones of KZN are bound to bring about several abiotic and biotic stress conditions, which have direct and indirect effects on the crop.23 Sweet potatoes are very sensitive to frost and require hot days and warm nights. The suitable conditions prevailing in the bioresource group areas along the coast, in parts of the midlands and the northern areas of Zululand,21,22 are dominated by smallholder farmers. The crop has a cropping season of 4-5 months so smallholder farmers can plant sweet potatoes from August to March, thus spreading the cropping season. Underutilised crops such as sweet potato tend to possess characteristics adaptable to abiotic stress conditions. These conditions are predicted to become even more prevalent in the coming decades as a result of the effects of climate change.24 The current and predicted challenges call for an agricultural system that is able to provide food crops that are capable of meeting current and future food demands and nutrition security. It is necessary to investigate whether the province that has a high population of rural poor people, namely KwaZulu-Natal, can be used as the major production areas for drought tolerant cultivars of sweet potatoes for food security and commercialisation in the near future. It has been reported that in some African countries, starchy crops such as sweet potato are the staple food while other countries use it as an additional or as a food security crop.14,26 The use of sweet potato for food security concurs with earlier reports that sweet potato storage roots were often kept in the ground and harvested when needed.26 Keeping the roots in the field not harvested is an indication that sweet potato can provide a continuous food supply during the off season with no requirement for expensive storage infrastructure. It becomes important in the diet seasonally, typically in the month or two before the major grain harvest or when the grain stock from the previous year has been exhausted. Sweet potato also provides a food reserve when the major grain crop fails because of drought15 and pest infestation. Storage roots can be boiled, baked or roasted with some people preferring to eat them raw. The leaves can also be consumed as a green leafy vegetable.10,25 Sweet potato leaves may possibly have some medicinal properties as the polyphenol-rich green extracts are reported to play a role in reducing prostate cancer.25,27,28 Reports from China, the leading global sweet potato producer, indicate that they also use sweet potato for starch production and as a raw material for biofuel production.1,29 The plant sap (juice) of red sweet potato has been reported to play a vital role in producing dye for cloth in South America. The attractive foliage adds aesthetic value30 and is another non-nutritive use of sweet potato. Flavonoid compounds of fruit and vegetables are considered therapeutic agents because they have health benefits such as their supposed protection against certain cancers, cardiovascular diseases and aging.27,28 It is necessary to investigate if and how drought affects these properties because phenols and flavonoids may be responsive to stress. From the perspective of food security, sweet potato is an excellent crop as it often survives where staple crops fail.1-3,13 It contributes to food availability by providing high output per unit of land (yields about 3.9-9.5 t/ha under communal agriculture compared to less than 1-3 t/ha reported for maize under similar management) and can produce on marginal soils.1,11 The fact that it has higher energy (Table 1) than maize, also adds more strength to its potential role as a food security crop. Moreover, the fact that new OFSP varieties also contribute significantly towards vitamin A supplementation in rural households, where vitamin A deficiency is more prevalent, makes it a crop of choice. Good health is considered an outcome indicator for food utilisation in food security measurement,4 and the high nutritional status of sweet potato qualifies the crop as a food security alternative. Improved early maturing varieties are often ready for harvest in 3-5 months and can be harvested as needed over several months.26,38 The benefit of harvesting early and consuming over several months implies that there is a quick turnover and a lasting source of food, hence, improved food access, availability and stability. The food security benefits of sweet potato mentioned above could also lead to the crop being removed from the 'underutilised' category. Raw and cooked sweet potato roots are highly nutritious.1,2,20,39 Moreover, orange-fleshed sweet potato is reported to contain high amounts of β-carotene, a precursor for vitamin A. 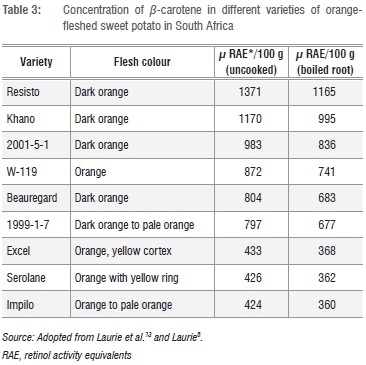 The β-carotene content increases with the intensity of orange colour of the sweet potato flesh.2,20,41 Leighton41 tested for β-carotene in different South African orange-fleshed sweet potato varieties (Table 3) and found that indeed, β-carotene concentration varied with depth of colour. Low et al.42 reported that studies conducted in sub-Saharan Africa demonstrated that consumption of boiled orange-fleshed sweet potato improved vitamin A status of children. A separate study by Amagloh43 confirmed that orange-fleshed sweet potato was high in vitamin A and could be used as a complementary food in infant feeding. To improve the consumption of this vitamin A rich type of sweet potato, Laurie and Van Heerden44 prepared different food types (chips, doughnuts, juice from the roots and a green leafy dish from the leaves) from orange-fleshed sweet potato to determine consumer acceptability. They reported that 92% of the consumers liked the colour of the food products while 88% indicated that they would buy sweet potato products or prepare them at home. impact, for example, food price increases. Sairam et al.49 further explained drought as 'an exogenous supply side-shock that causes marked declines in agricultural output, export earnings, employment and income levels'. It affects all facets of economy because of close sectorial linkages. The four main categories of drought (meteorological, agricultural, hydro-logical and socio-economic) have a direct impact on food security in the sense that they challenge the whole notion of food availability, accessibility, utilisation and stability. The fact that South Africa is a drought prone region already provides reason to focus on drought. Additionally, climate change predictions that there will be increased frequency and severity of such droughts25 gives an even greater sense of urgency to identify crops that are resilient and can produce under such adverse conditions50. These crops should not only possess drought tolerant characteristics, but should also be nutritious. It is in this context that sweet potato is being touted as a possible fit. However, before one can successfully promote the crop as drought tolerant and nutritious, one needs to generate empirical information detailing the crop's responses to such conditions. Diminished biomass caused by water stress was observed in almost all cultivars of sweet potato; however some cultivars showed better stress tolerance than others.53,54 The fact that water stress inhibits leaf expansion and vine extension39,51 suggests that general vegetative growth in sweet potato would be compromised because the canopy represents the only source of biomass for subsequent partitioning to the storage root. Studies by Jaleel et al.23 indicated that water stress can reduce yield in many crop plants and that different crops respond differently to water stress. As the canopy represents the only source of biomass for subsequent partitioning to the storage root in sweet potato, if biomass is limited, it would consequently impose a source limitation of assimilates to storage roots thus lowering final yield. Little information or literature is available which details the extent to which sweet potato yield would be affected if vegetative growth was inhibited by water stress. Saraswati et al.51 only reported on morpho-physiological characteristics of sweet potato when exposed to water stress; they did not report on the effects of water stress on yield. According to Lebot39, attempts to demonstrate relationships between yields and particular morphological or physiological characteristics have so far been unsuccessful. However, varieties with small canopies, short stem length and small leaves were reported to have the capability of giving higher yields than those with long stems and numerous broad leaves.55 The higher yields in small canopy varieties might be a result of plants maximising storage root development and expansion over shoot extension. Given that different genotypes will respond differently, there is a need to evaluate available genotypes across the range of climates where sweet potato can be grown, to allow for the formulation of better recommendations to assist farmers with variety selection. Plants exposed to environmental stresses such as drought and heat stress respond by showing ingenious adaptations at physiological level, which may be accompanied by changes in various gene expressions.56 The biological response and tolerance of plants to drought stress such as physiological, biochemical and transgenic tolerance also need to be understood. Sweet potato exposed to drought stress recorded low photosynthesis by reducing chlorophyll 'a' fluorescence, stomatal conductance, intercellular carbon dioxide (CO2) concentration and CO2 assimilation rate primarily through stomatal closure.57 Photosynthetic pigments are important for harvesting light and producing reducing powers in plants.48 Chlorophyll 'a' and 'b' are reported to be susceptible to soil drying.48,54 Foliar photosynthetic rate of higher plants is known to decrease as relative water content and leaf water potential decrease. Severe levels of drought are capable of causing irreversible damage to photosynthetic apparatus. Both stomatal and non-stomatal limitations were generally accepted to be the main determinants of reduced photosynthesis under drought stress conditions.28,46,48 Bray56 also reported a reduction of both chlorophylls a and b, and total chlorophyll at high water stress. This reduction was reported to be associated with an increase in electrolyte leakage caused by leaf senescence and reduced water use in plants. The C3 plants of tropical origin, such as sweet potato, colonise easily in a drought environment because they have high phenotypic plasticity. Phenotypic plasticity refers to the ability of the plant to alter its characteristics in order to acclimate to variable environmental conditions. In sweet potato and other C3 plants, all photosynthetic cells are functionally equivalent, thus allowing each cell to acclimate to new environments in a more autonomous manner than those of C4 plants. This functional equivalence allows for photosynthetic plasticity at cellular rather than tissue level, resulting in a greater acclimation ability of C3 plants in general. This C3 metabolism allows sweet potato to be classified as a drought-tolerant plant.54,58 Earlier studies on C3 plants also indicated that maximum rate of assimilation was more strongly temperature dependent than water dependent and that considerable photorespiration takes place in sunlit photosynthetic organs. Where light intensity is low, there would be 1% decrease in light use efficiency for every degree of temperature increase.59 This report emphasises the importance of light and temperature in sweet potato production. Increases in photosynthetic plasticity and assimilation results in higher yields and this plasticity may also explain why sweet potato possesses wide adaptability when compared to common C4 staple crops such as maize. Protein expression, accumulation and synthesis are modified in plants exposed to drought stress. According to Bray56, these drought-induced proteins are important for physiological adaptation of plants to water stress. The drought-induced proteins are referred to as dehydrins and belong to the group II late embryogenesis abundant (LEA) proteins.56,60 Studies performed on plants (wild watermelon and maize) under mild water stress reported more than 16 proteins involved in water stress responses.60,61 Proline is one of the proteinogenic amino acids with exceptional conformational rigidity and is essential for primary metabolism in plants.62 It is involved in the synthesis of proteins that are necessary for a stress response. This amino acid is of particular interest in stressed plants and is usually considered an osmoprotectant and accumulates in cells to obtain suitable conditions for water uptake under limited water conditions in the roots. It is also involved in reducing oxidative damage by scavenging and/or reducing free radicals. Proline was found to be involved in tolerance mechanisms against oxidative stress and was the main strategy by which plants avoided detrimental effects of water stress. A study conducted on the influence of water stress on proline accumulation concluded that increases in proline levels helped protect cell membranes from oxidation instead of osmotic regulation as an initial response to water stress.54,62 Proline accumulation can influence stress tolerance in multiple ways because it functions as a molecular chaperone, able to protect protein integrity and enhance the activities of different enzymes.61,62 While there are two schools of thoughts in as far as proline accumulation is concerned, the bottom line is that it will accumulate in response to environmental stresses. Whether or not its accumulation is a sign of stress tolerance or rather a symptom of the severity of the stress is still debatable and is an avenue that needs to be explored, especially in food security crops like sweet potato. Modi and Mabhaudhi50 suggested that, despite the controversy surrounding its exact role, proline accumulation could still be a useful index in drought tolerance. However, the authors went on to state that its value as an index could only be fully understood if other stress metabolites were also quantified alongside it. As a phytochemical, carotenoids were reported to protect against the eye disease, macular degeneration.36 β-carotene is of particular importance because it is a precursor for vitamin A. Vitamin A is important in human nutrition because of the role it plays in improving vision, bone growth, reproduction, maintenance of epithelia and overall growth.64 The orange-fleshed sweet potato varieties contain high amounts of β-carotene and are being promoted in vitamin A deficiency alleviation programmes in South Africa and other developing countries. The fact that sweet potato can synthesise β-carotene to protect itself from oxidation stress and further store the β-carotene in both leaves and storage roots, is an indication that it is an important food security crop which can withstand drought stress conditions and still alleviate chronic malnutrition diseases associated with vitamin A deficiencies. Many responses to water stress are controlled by a number of genes with different functions. Many regulatory processes are initiated the minute water is lost from plant cells, to help adjust cellular metabolism, and result in changes in gene expression.56 Changes in expression patterns have been monitored on the plant when drought stress is perceived. These changes range from genes whose products are involved in early responses such as signal transduction, transcription and translation factors; to late response genes, such as water transport, osmotic balance, oxidative stress and damage repair.54 Whether these water stress induced genes perform an adaptive role or not is still to be investigated. Genetic engineers have tried to develop transgenic sweet potato plants by gene coding for spermidine synthase which is used to improve environmental stress. The transgenic sweet potato from this genetic coding showed high tolerance to drought, salt, chilling and heat stresses.65 Recent reports indicate that transgenic sweet potato, containing the gene which is important for osmoregulation and abiotic stress, showed tolerance to multiple environmental stresses such as protection against cell damage, improved photosynthetic activity and increased activity of free radical scavenging enzymes.60 These reports are proof of good progress in genetic engineering in as far as sweet potato drought tolerance is concerned, but there is still a shortage of successful screening methods and multidisciplinary approaches and genotype by environment interaction.14 It is therefore believed that with the existence of these strength-enhanced drought tolerant varieties, food security will improve as long as the genotype by environment interaction selection is carried out in the environment in which the varieties will be released and grown. Increased productivity in rain-fed agriculture reduces pressure on the limited arable land and water resources. Knowledge of weather and climate can reduce the impact of drought on communities, and this can be achieved by employing two distinct strategies. The first is long term planning in which strategies can be devised, and precautions taken to reduce impact. This planning includes climate and weather evaluation using scientific systems research tools such as simulation models, optimisation techniques, geographic information systems and databases.66 The FAO AquaCrop model has already been calibrated and validated on OFSP varieties and proved to be useful in exploring irrigation options in sweet potato.67 Adjusting planting dates (or timing of planting) and harvesting, substituting cultivars and, where necessary, modifying or changing the cropping system altogether, has also been identified as a long term strategy.68 Adjusting planting dates for sweet potato production in KZN so as to allow yield maximisation could be a suitable management strategy. The second phase where application of weather and climate knowledge can reduce impacts of drought is by taking action during the onset of the event (planting/growing season) to reduce adverse effects.68,69 This action may include, but not be limited to, adopting proper crop management strategies such as water conservation strategies, manipulation of plant population, water recycling, rainfall harvesting into ponds or village tanks and even mid-season corrections.23,69 Farooq et al.52 further recommended adoption of strategies such as mass screening and breeding, marker-assisted selection and exogenous application of hormones and osmoprotectants to seed or growing plants, as well as engineering for drought tolerance. The two phases suggested by Das66 of using weather and climate to mitigate and plan for drought; adaptation of agriculture to stability and resilience of production and conservation tillage68,69 and other best practices, all form part of climate-smart agriculture. According to the FAO69, the aim of climate-smart agriculture is to increase productivity in an environmentally and socially sustainable way, strengthen farmer's resilience to climate change, and reduce agriculture's contribution to climate change by reducing greenhouse gas emissions and increasing carbon storage of farmland. Sweet potato remains an important root crop with an inherent ability to produce more edible energy than most major food crops. It is suitable for production on marginal lands and can play an important role as a food security crop. The importance of OFSP varieties in supplementing vitamin A deficiencies cannot be overemphasised. And production of the OFSP varieties in areas with a prevalence of vitamin A deficiency should be promoted. It is possible to produce this crop and have it available all year round in the tropical and subtropical areas of South Africa where warm conditions prevail, even if drought is a challenge for staple crops such as cereals. Rain-fed crops are always subjected to water stress during the course of growth because of the unpredictability of rainfall in subtropical environments. Sweet potato has the advantage of being drought tolerant after establishment. Hence, its yield potential is generally greater than that of popular staple crops of South Africa, such as maize. In addition to yield advantage, the higher nutritional value of sweet potato is of benefit to farmers producing under conditions that are susceptible to drought stress. While this review has identified sweet potato as a potential food security crop for dryland production, there are still challenges that may limit its potential to fully contribute towards food security. There is a need to introduce more participatory research and extension to educate smallholder farmers about the value of sweet potato as a major crop for subsistence and rural economic development. We acknowledge the Organization for Women in Science from the Developing World (OWSD) and The World Academy of Science (TWAS) for funding. N.M.M. performed and wrote the literature review. A.T.M. was the project leader and supervisor and provided conceptual direction for the review. T.M. provided guidance and mentorship.